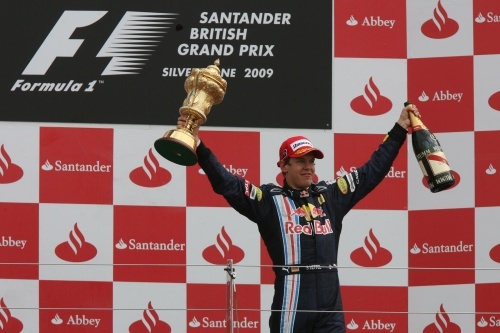 Red Bull’s Sebastian Vettel has won the British Grand Prix here at Silverstone today. And BRDC Full Member Mark Webber made it a Red Bull one-two by finishing as runner-up at what he considers his second ‘home race’ as he lives near to the circuit and the team is just a few miles away in Milton Keynes. BRDC Honorary Member Rubens Barichello took the final podium spot in the Brawn. BRDC Full Member and championship leader going in to the race, Jenson Button, was sixth. The British driver had got up to third but the pit stop strategies did not see him able to hold on to the position for the team, based just up the A43 in Brackley. BRDC Full Member and defending champion Lewis Hamilton came home in 16th. Silverstone-based Force India’s highest placed driver was Giancarlo Fisichella was tenth while Adrian Sutil was 17th.